Thom Hartmann is coming to Free Speech TV! FSTV airs on Dish Network and 200 cable systems nationwide. One hour of Thom’s radio show will now be simulcast by the satellite channel (2-3pm ET). Even bigger news is the new show he is starting just for television, weekday evenings at 9:30pm ET on Free Speech TV. Hartmann is an awesome activist, cogent thinker and soothing presence in the talk radio ionosphere. I suggest you start with his amazing book The Last Hours of Ancient Sunlight and his latest Threshold. Download or stream HERE the Digital Crossroads originally airing 11/14/08. 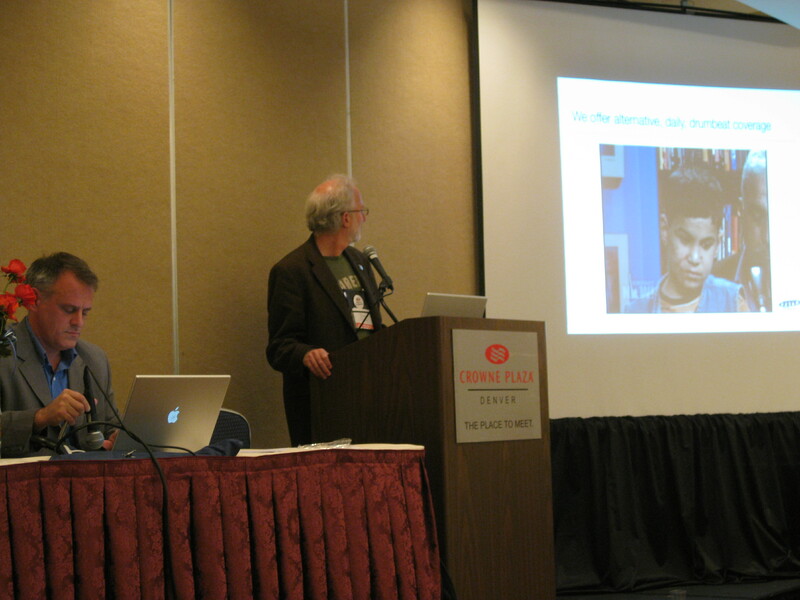 The Alliance for Community Media West held its annual conference in Denver, Colorado in late October. Denver Open Media hosted the festivities. Digital Crossroads takes you there, with clips recorded on site. Today’s show is an examination of the relevance of community media and the value of youth media literacy. Denver Open Media is unique. According to Executive Director Tony Shawcross, featured toward the end of the show, on their main channel content might air ten times, but at Denver Open Media viewers can vote as they watch and on the website. The material that is most popular airs on the highlights channel, Channel 57. Much of the discussion at this year’s conference drove home the point that Public, Educational & Government access or PEG channels must be thinking of ways to modernize. The idea of Cable Access 2.0 is a serious attempt by community television to stay relevant. Free Speech TV CEO Dennis Moynihan makes a lunch time presentation, highlighting many programs carried by cable access stations, including his former employer Democracy Now. ACM Western Region Board Chair J Robertson watches the clip. Today’s show features audio clips from Daniel Weinshenker, who hosted a 90-minute presentation called Digital Storytelling. You can download or stream my audio recording of his entire presentation by clicking HERE. He is director of the Denver office of the non-profit Center for Digital Storytelling. You will also hear from youth working in access media production. Plus, staff members from Denver Open Media discuss youth media literacy and Glam Camp, the teen girl multimedia production camp. 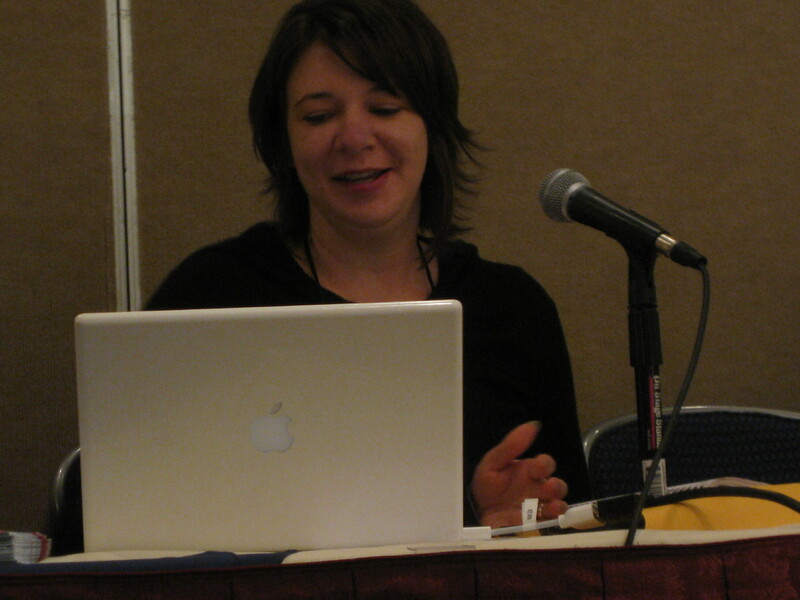 Beth McConnell explained how policy advocacy can shape community media’s future. The Media & Democracy Coalition is made up of more than two dozen non-profits who are networking to change the media. Music on this week’s show by Ooah, The Tasteful Nudes & Gabriel Teodros. Special thanks to Ann Theis, who brings joy and dedication to Denver Open Media. Great people, great materials, great conference! My radio show is produced for Boise Community Radio, KRFP Moscow and other great non-commercial broadcasters. Contact me if you would like to hear the show on your local radio station. Digital Crossroads is back. Hosted by Radioactive Gavin with headlines, clips and original interviews focusing on community media, grassroots activists and government officials. LISTEN to or DOWNLOAD the pilot. Pilot features interviews from the 2008 Free Press Conference on media reform. Dennis Moynihan of Democracy Now! and Free Speech TV. Joe Torres of Free Press. Sam Husseini of Institute for Public Accuracy and Washington Stakeout. Malkia Cyril of Center for Media Justice. 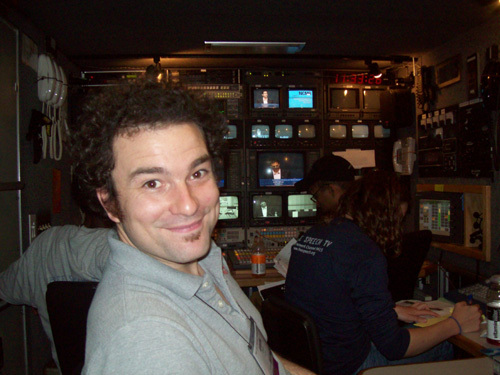 My friend Robert Kam of Thurston Community TV took this picture of me in the Free Speech TV satellite truck. I ran sound for the national broadcast during opening speeches on Friday. The truck had more than 40 TV monitors! The first day, Thursday, I spent quality travel time with Karen Toering of Reclaim the Media and Angela Ballantyne of UW Communication Studies. We arrived at the airport early in the morning, before the storms started kicking up. I was able to speak on mic with Robert McChesney of Free Press and Marc Cooper of Consumer Federation of America. Listen for this and more fresh audio on Digital Crossroads Friday June 13th and 20th. The academic symposium was pretty cool. I attended some research presentations. I think my favorite was “Sustaining Independent Media” featuring Cynthia Cotti on LPFM licenses as agents of localism, Jessica Clark & Tracy Van Slyke on measuring media impact, Adam Davis looking at the political economy of Current TV, Caroline Nappo on the significance of librarianship for media reform. I’m hoping to have all these awesome graduate student folks on Digital Crossroads soon. Then I caught a swim at the Hyatt and a nap. Go to freepress.net/conference and Free Speech TV to watch events of the conference as they happen.